Imagine if we could speak directly to the ancient Pharaohs and Queens? What would they sound like? What would they tell us? Well it’s more than possible and it’s the subject of the film. Using the work of psychic channeller Neferatiti Ife who has been communicating with the Pharaohs for over a decade. She is able to record her encounters with amazing clarity. Proving that we all have the ability to bend time and space to reach beyond the stars. This of course is nothing new and is still alive today though in different forms particularly among the artists and preachers and in all indigenous cultures around the world. For the Kemetians it was a fundamental method to access knowledge and wisdom. It is the spiritual first internet, where through meditation one is able to download information, travel through different realms whether ancestral or inter planetary. Essentially every form of life has energy and intelligence that we can tap into, be planets, water, wind, sky, moon, trees etc. 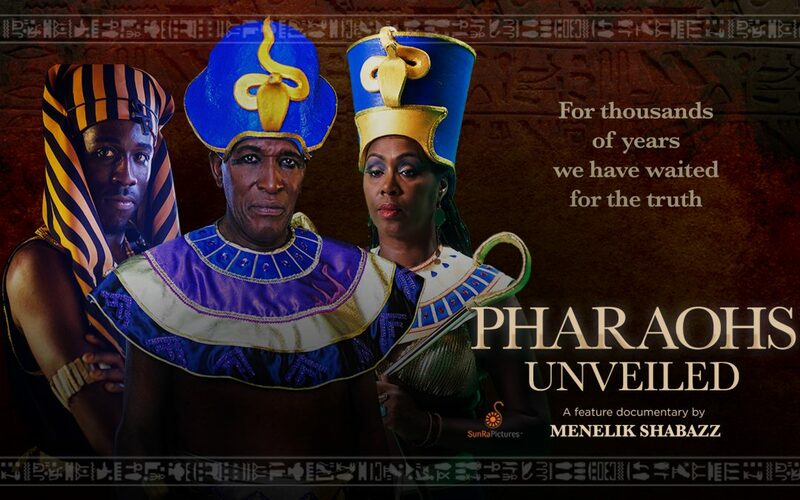 Coming back to the film it’s been my quest for decades to get to the truth about the Kemetians (they didn’t call themselves Egyptians) and their spirituality. Through the breakthrough work of Neferatiti this is now a reality. So many books have been written, programmes being made, archaeologists are still digging and we are still no closer to understanding the truth about who they were. The keys are always in a place where you are not looking. It is in the ancestral world that holds the keys to the knowledge I needed. The Kemetians in their communications made it clear that they took the knowledge with them because they could see how others would claim it for themselves. The ancestral realm is often clouded in fear and darkness particularly through the religions so many people are prey to. People are deliberately blinded to the importance and benefits of the Ancestors. Everything about what we Africans are spiritually is bad unless sanctioned by the establishment. Their mission is to keep us asleep and distracted from who we are and what we are capable of doing. They don’t want us to know that the Pharaohs were Africans! They don’t want us to know that we achieved anything. Especially in the spiritual realms where were are the masters they have worked hard to keep us away from highly advanced spiritual knowledge that they can’t fully grasp. At the height of the spiritual knowledge sits the Kemetians. When you hear the voices and message of these great beings still alive in the spirit world I guarantee you will not be the same again. The films brings you very powerful audio recordings that take you beyond the bricks and mortar of the historians to an intimate portrait that you will not of seen or heard before. They want their true story to be told and Nefertiti is their chosen oracle. They explain their spirituality and its importance, in fact it was central to their ability to create buildings that lasted for thousands of years. In the film we hear the voices of Pharaoh Akhenaton, his wife Queen Nefertiti, Imhotep the great and others. They not only inform about how they lived their lives but also have messages for us in this time. They are not happy that they are forgotten by their African people and are concerned about their plight as indeed the plight of this planet. They want to help us to move forward spiritually and save our dying planet. A planet they worked so hard to rise up. The film is for those who want to discover more about the spirituality of the Kemetians and the power of the ancestral world. Using channelling as a vehicle and force for transformation of self and the community it opens up unimaginable worlds and possibilities for the human race.